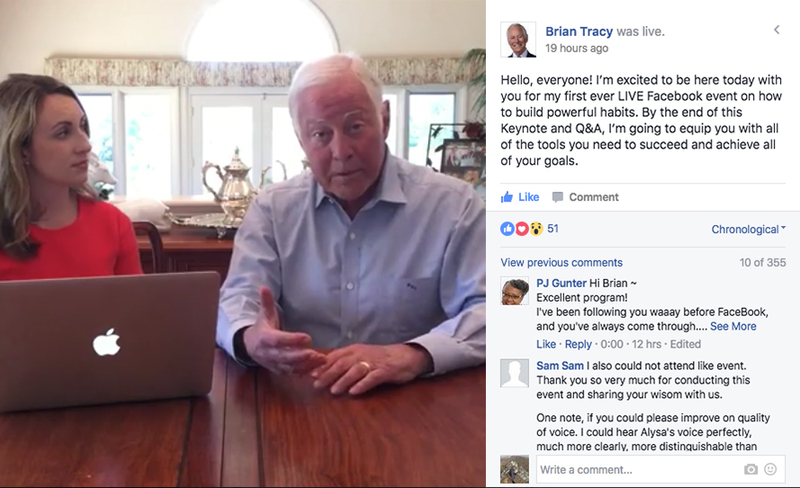 Facebook Live Event Replay: "Power of Habit"
Access to the exclusive replay of a 1 hour keynote on the Power of Habit with Brian (in his own home!) and a 45 minute Q&A session with Brian, where you can listen to him answer real questions on forming habits to achieve personal goals. Permanent access to a private Facebook group for all attendees — share your progress and communicate directly with Brian! After purchasing, you will receive an email with an invitation to join the private Facebook group, where you can access the replay of the video. Please register using the name associated with your Facebook account. *Note: You must have a Facebook profile to attend this event. If you do not have a Facebook profile, instructions on how to create one will be provided in the email you'll receive after filling out this form. Share the webinar with your friends! For any questions or concerns, please email support@briantracy.com or call (858) 436-7300.